The 2018/2019 K2 Pinnacle Pro 130 was tested in the men's On-Off medium width category at Silver Mountain Resort by the experts at America's Best Bootfitters, powered by Masterfit. 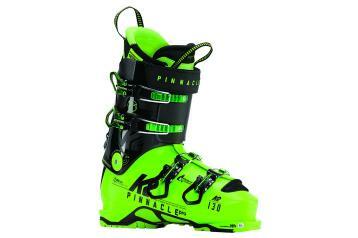 Testers again put the 2019 K2 Pinnacle Pro in the group of best-skiing freeride boots for its ability to drive a big, fat ski at speed and for its lightweight Pebax construction. Is it a lightweight All-Mountain boot with a hike mode or a Backcountry boot that skis like an alpine ride? Go either way, testers say—it does it well in both realms. Testers say this year's revised PrecisionFit Tour Light liner has nicely opened up some room in the toebox and forefoot, and while it improved the previously tight fit on the navicular somewhat, that area remains more snug than expected for testers. Testers with large calf muscles liked the amount of available space (with the spoiler in) and said that this is a great option for that cyclist-calf guy looking for a comfortable freeride boot. Similar to last year, testers again found the heel pocket to be quite snug. The Pebax lower shell and cuff construction makes for a lightweight ride and a snappy one. The resilience of Pebax created a lot of rebound energy and quick returns to center, testers said—sometimes to a fault, with a couple testers mentioning they had to work to keep a bridle on the horsepower. Lateral moves were solid and strong, they agreed, claiming that the Pinnacle Pro generated progenitor-Pinnacle-level power to the edge at a fraction of the weight. This fact, combined with the Syncro Interlock's long-travel touring range of motion makes the Pro the go-to for good skiers who are serious about going up, too. Testers say it's nice to find a functional upper cuff adjustment on a backcountry boot (often lacking) and they said that the new liner's articulated area seemed to improve the quality of movement when the cuff was released. As always, testers dig the ease of the Syncro Interlock's release toggle. The Pinnacle Pro (like the other Pinnacles) is tech binding compatible and rockered Vibram soles are available as an extra.